It's rain rain everywhere as wherever we turn our heads, people are talking about the arrival of monsoons. We thought that it's too much of a good thing, but no, we can never get enough of the rains or conversations about them! Last weekend, the WOW prompt was “The Dripping Roof”, which we guess brought on a flood of memories and ideas to our bloggers! We loved all the entries that we saw in the morning today, and it chased away our Monday blues for good! Congratulations to everyone who is featured in the list. 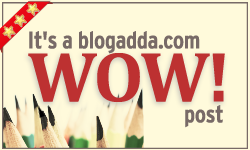 Enjoy flaunting your WOW badge and keep up the WOW work!